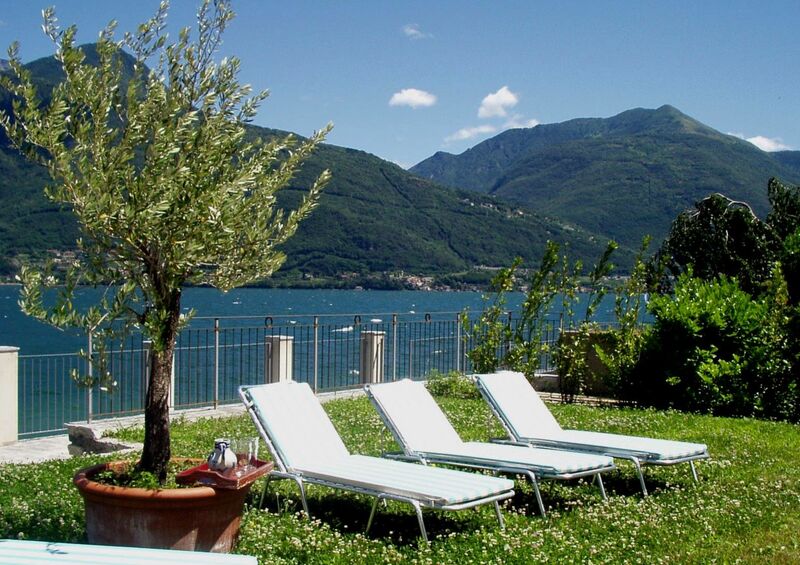 Situated in a priveleged location with direct acess to the beach this wonderful lakefront property is located only ten kilometers north of Menaggio - on the northwest shore of Lake Como. 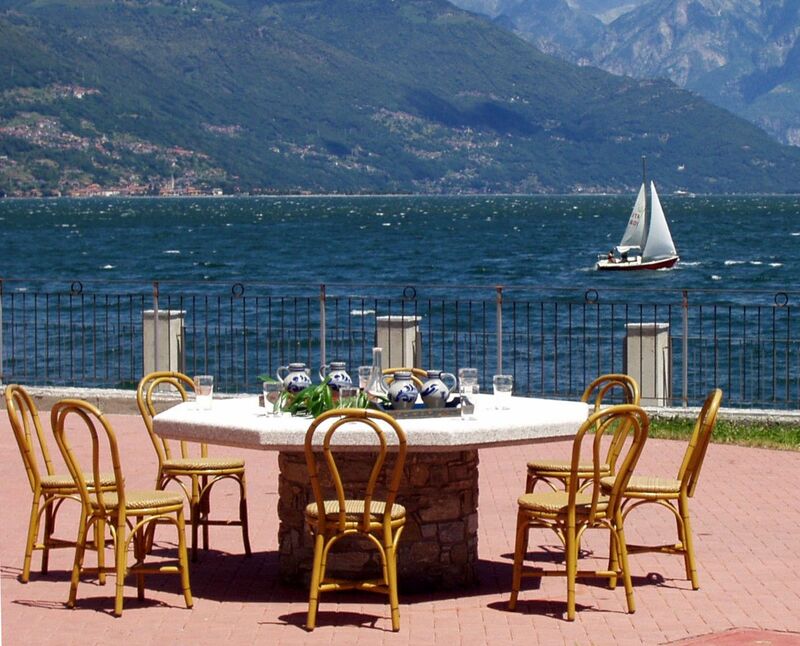 The large panoramic terrace offers breathtaking views of the lake and the surrounding mountains. 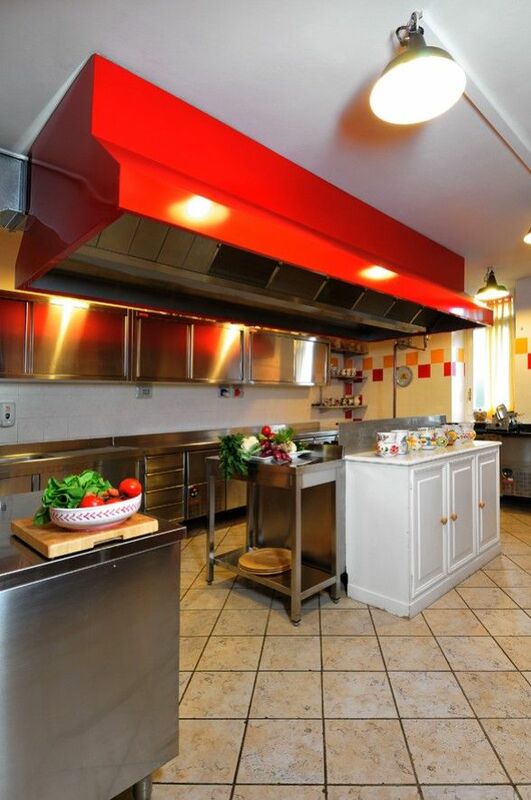 Spacious, bright interiors which are tastefully furnished - the ideal holiday home for large parties. Air-con in some bedrooms. Wifi. Games room for children. Ideally located walking distance to village. There is a living room with 3 comfortable sofas, SKY TV sat and DVD and the Internet corner (WIFI, Pc, Printer and Scanner, Stereo). 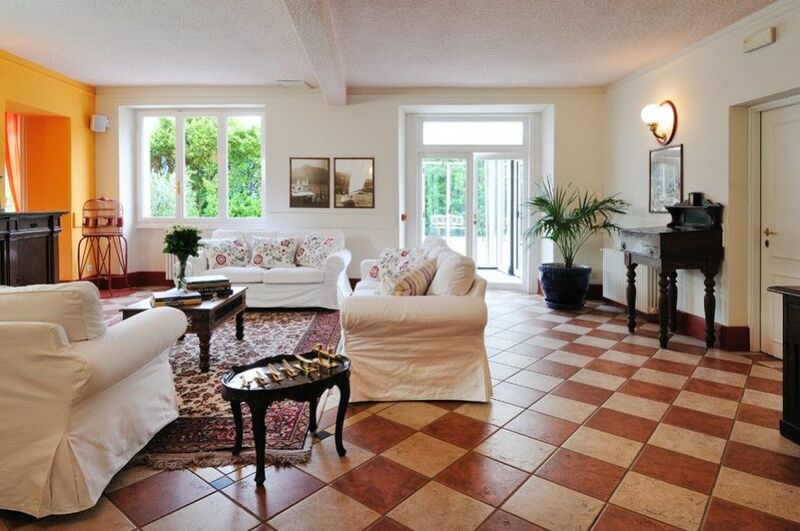 The wall facing the lake has large French doors opening to the spacious panoramic terrace (350 sqm!!). This floor features also a fully appointed kitchen, a large dining room with table for 14 people, and a games room for children. On this floor there are also 2 half bathrooms and 1 bathroom with shower with facilities suitable for disabled. Upstairs there are 5 air conditioned double bedrooms (cannot be separated), each with bathroom. Two of the rooms (the blue and the white bedrooms) have each an adjoining single bedroom ( NO AC ). Four bathrooms have a shower, one has a bathtub. 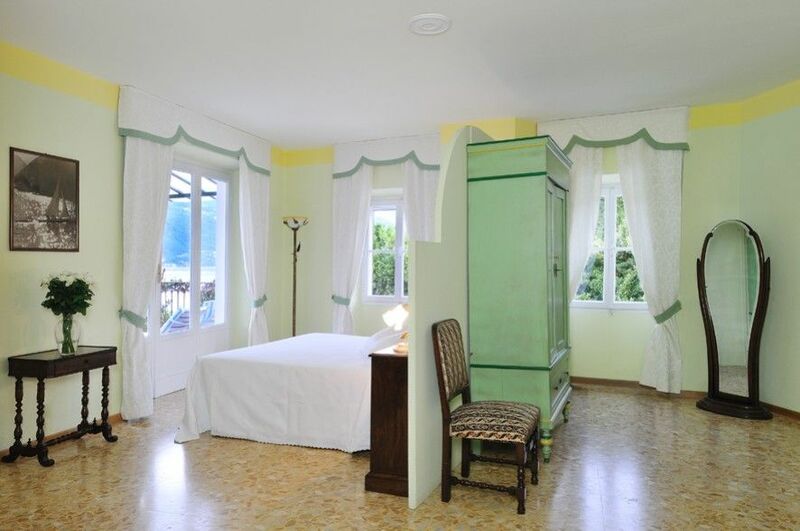 Two bedrooms (green and white) have direct access to a balcony furnished with table and chairs. On this floor the owner recently added one twin bedroom. 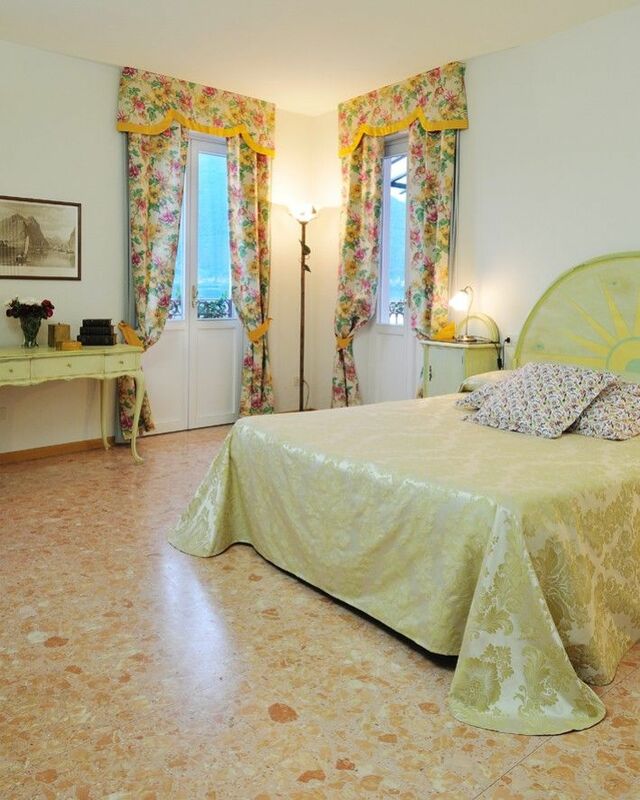 This room has AC, but it is very small therefore we think that it is suitable for children, nannies or staff. 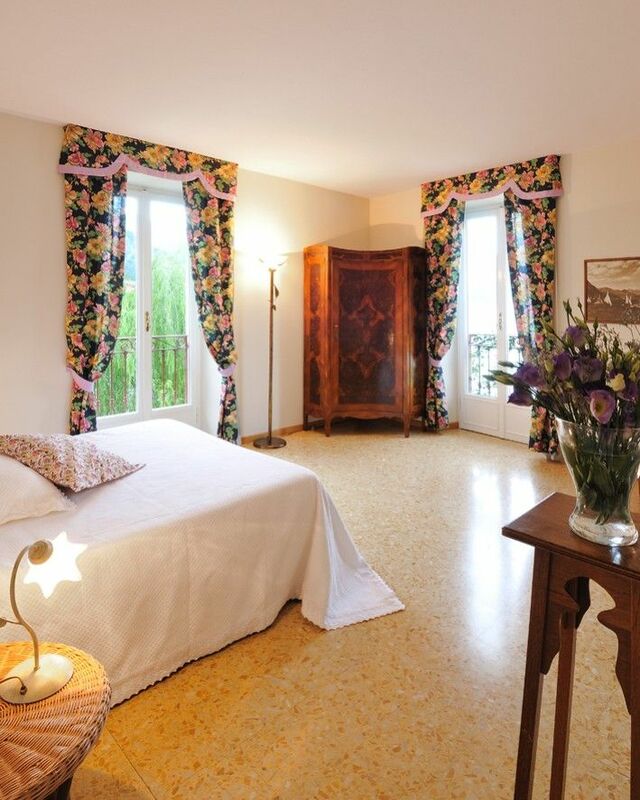 One double bedroom (AC) with ensuite bathroom with shower and access to the panoramic terrace. One double bedroom (AC) with ensuite bathroom with bathtub and handheld shower. Adjoining single bedroom. One double bedroom (AC) with ensuite bathroom with shower. One double bedroom (AC) with ensuite bathroom with shower. Adjoining single bedroom. Twin bedroom (AC) with ensuite bathroom with shower. 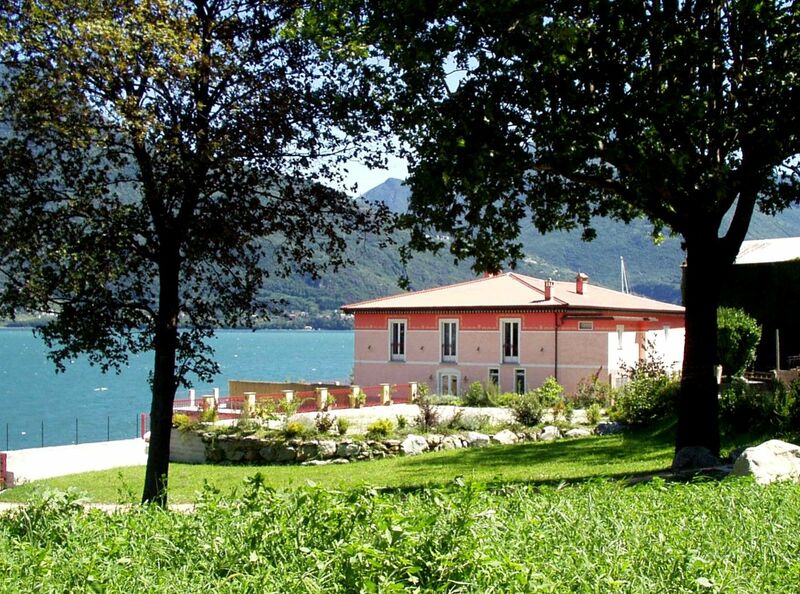 Outside: the property (2500 sqm) is just on the shore of the lake, few meters from the beach (public beach). In the large terrace (45 meters x 8 meters) there is a new swimming pool (5x3) which can be heated if required and also closed with a gorgeous glass house. Behind the house there is a parking area where 6 cars can easily be parked. Behind casa Diana is the Museum of the ancient boats of the lakes, on its left is a small boat yard, on its right is the beach, while the statal road is behind the museum. The village is aprox 600 meters from the property. Please note that; A pedestrian path runs along the shore between the lake and the property. For this reason privacy on the terrace could be limited specially during July and August. - whilst we are not talking about vasts amounts of people we do believe it is our duty to mention it The lakefront has public access. This is not an isolated property but it does benefit from proximity to the lake and the village. - Guest Relations available throughout the stay at the villa. - Any extra person from 13 pax to 16 pax will pay 350 Euros per week. Swimming Pool opening dates May 12 to September 22 - Heated pool included from 12 May to 22 September. Other periods 4 Euro per hr. Visit the Museum of "La Raccolta della Barca Lariana" just 50 m behind the villa. The museum features over 600 boats that played an important part in the nautical history of the lake from the 19th century to today. Among them, there is a Venetian gondola from the last century which was built on Lake Como, and a Cisco, which is a typical English sailing boat also from the last century. The museum can be visited only by appointment. Tourist sites: Bellagio known as the 'pearl of the lake' thanks to its position between the two arms of the lake and the mediaeval village of Varenna, Tremezzo with the neo-classical Villa Carlotta (one of the most beautiful villas of the lake with its botanic garden and artistic masterpieces), the 16th century Villa Balbianello in Nesso, Menaggio, Varenna (Villa Monastero) and Como with its important historical buildings. Distances by car: Villa Carlotta in Tremezzo 20 minutes, Varenna and Bellagio 15 min by car + 15 min by ferry, Como 1 hr, Lugano (and nearest highway intersection) 1 hr, Milan city centre 1,30, Saint Moritz 2 hrs. It is necessary to have a car in this region. Sport: The nearest golf course, tennis court and equestrian club are 10 km away in Menaggio. The Lake of Como and in particular the northern zone of the lake is renowned in all of Europe as an excellent sailing area - this is the most windy area of the lake and the most unspoilt; the Breva, a temperate breeze of the Lake of Como, blows during the afternoons, guaranteeing enjoyment for sailing, windsurfing or kitesurfing. The area offers numerous alpine destinations and several trekking and mountain bike trails. Shopping: The main factory outlet shops (Armani factory shop, Fox town, Ferragamo, Versace, Etro, Gucci, Mantero, Lario) are within 10-30 minutes from Como. Malpensa/Linate airports 1.5 hrs, Bergamo Orio al Serio airport 2 hrs, Saint Moritz 2 hrs, Venice 3.5 hrs, Florence 4 hrs.